Happy Saturday, friends! What a GORGEOUS day it is here in Nashville. Makes me want to stay outside all day long! How is the weather where you are? Today I'm talking all things beauty-- a new makeup line my friend Kaylee introduced to me! Savvy Minerals by Young Living is changing. the. game. when it comes to a quick and easy makeup routine! Not only do their products make your makeup routine easier, they're SUPER healthy for you! So last weekend, Kaylee came over and I got to play around with some of the Savvy products! 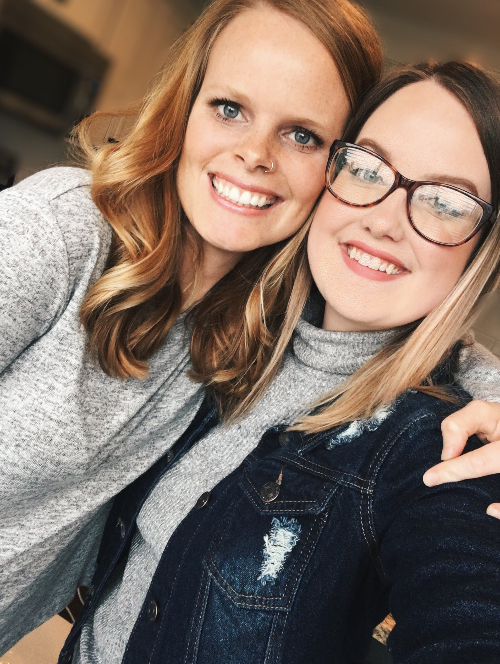 She let me do a full face of makeup to see how each product worked, and I have to say - I was pleasantly surprised with how much I liked them! For Kaylee's look, I started with a more sheer, natural coverage. I started by priming her face with the misting spray (which I also used to set her face after I was done) and then began brushing on the foundation. I contoured with bronzer and blush, then set her under-eye area with the Diamond Dust. For eyes, I used the Residual eyeshadow on her lids to give them a natural shimmer. Then I used the Multi-tasker to thinly line her lids and add some dimension to her crease! It was the perfect chocolatey brown shade that blended beautifully! You'll also be added to her "Oily Community" with loads of resources and support to help you as you get started with your new makeup! Woohoo! Visit Kaylee's Instagram, Lavender & Violet, or click her special link here to order your own Savvy Minerals Starter Kit today!